February is Heart Month! This is a great time to take stock of our diets and lifestyles to improve our heart health. Our favorite way, of course, is to find new ways to incorporate more olive oil into our diets. Both the USDA and the American Heart Association recommend limiting saturated fats because it can raise your levels of LDL, or “bad” cholesterol, and therefore, up your risk of heart disease and stroke. Olive oil has been shown to lower LDL levels, as shown by a study published by Nutrition and Diabetes. HDL particles "scour" the walls of blood vessels, cleaning out excess cholesterol that otherwise might have been used to make the plaques that cause coronary artery disease. Olive oil raises your HDL or good cholesterol levels. A study published by Arteriosclerosis, Thrombosis, and Vascular Biology concluded that the polyphenols in olive oil were shown to have a positive effect in HDL function. What about coconut oil or ghee? Despite the hype, saturated fats such as coconut oil, beef tallow, butter and ghee are still not recommended by most doctors, nutritionists or dietitians. How did coconut oil gain its reputation as a health food? Some people have argued that coconut oil acts differently in the body than other types of saturated fat. But a review of 21 studies published earlier this year in Nutrition Reviews refuted that claim as “inaccurate.” And while some researchers have noticed that people who eat a lot of coconut products don’t experience negative heart complications, the authors discredit that point too. Those populations consisted of indigenous people who were eating either the flesh of the fruit or coconut cream as part of a traditional diet, the authors note—not just adding the oil to their Western-style meals. 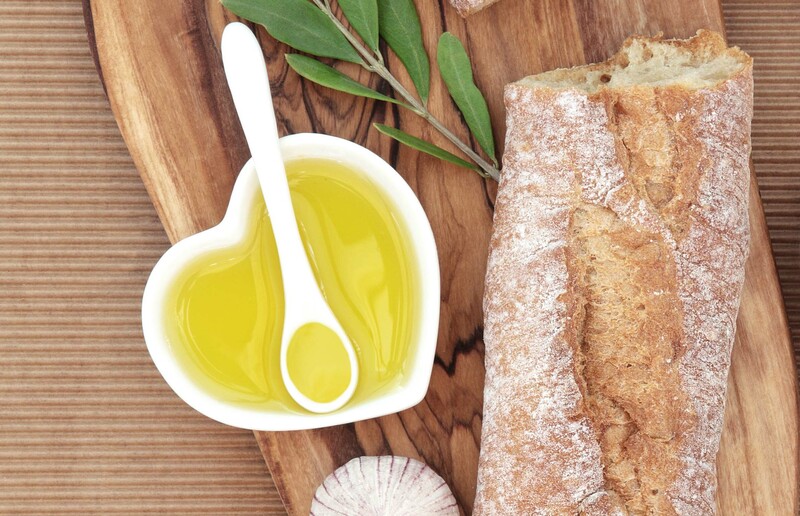 Which olive oil is best for my heart? All olive oils, both extra virgin and refined, have more heart-healthy monounsaturated fat than other common cooking oils. Extra virgin olive oil contains more antioxidants and polyphenols than olive oil and thus, may confer even more health benefits. You do not need to spend a lot of money to gain the health benefits of olive oil. Choose what you like and can afford. How can I incorporate more olive oil into my diet? Many people use olive oil only for dressing or to finish a dish. To truly take advantage of the health benefits of olive oil, do what the Mediterraneans do and use it for everything. You can cook and fry with olive oil and even use it as a fat in desserts. Olive oil is truly the only cooking fat that you need.